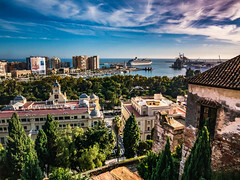 The tourist information resource for Malaga , Spain. 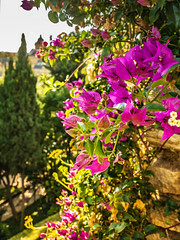 Search apartments and villas direct from the owners, hotels, video's, pictures and many more ..
Population of the city of MÃ¡laga proper was 558,287 as of 2005 estimates. Population of the urban area was 814,000 as of 2005 estimates. Population of the metropolitan area (urban area plus satellite towns) was 1,074,074 as of 2005 estimates, ranking as the fifth largest metropolitan area in Spain. MÃ¡laga is surrounded by mountains, lying in the southern base of the AxarquÃ­a hills, and two rivers, the Guadalmedina (its on the left bank) and the Guadalhorce, flow near the city into the Mediterranean.The climate is mild and equable, the mean annual temperature being about 66Â° Fahrenheit. 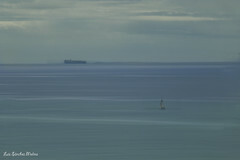 For its broad sky and broad expanse of bay the city has been compared to Naples.The inner city of MÃ¡laga is just behind the harbour. The quarters of El Perchel, La Trinidad and Lagunillas surround this centre. The city has much revenue from the agricultural sector and from tourism. Ø§ÙÙØ©).At a late stage of the reconquista, the reconquering of Spain, MÃ¡laga became Christian again, in 1487.MÃ¡laga underwent fierce bombing by the Italian and Francoist insurgent air forces during the Spanish Civil War in 1936. 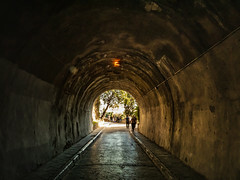 Tourism on the adjacent Costa del Sol boosted the city's economy in the 1960s.The magnum opus of Cuban composer Ernesto Lecuona, "MalagueÃ±a", is named for the music of the gypsies of this region of Spain. The city is a popular tourist destination, due mainly to its proximity to the Costa del Sol. 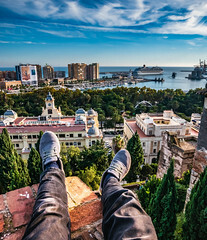 There are very cheap flights to MÃ¡laga from countries in Northern Europe, particularly the United Kingdom, Ireland, the Netherlands and Germany.From MÃ¡laga, other cities of Andalucia, like Sevilla, CÃ³rdoba, Granada, and JaÃ©n can be reached by train, bus or car.A popular walk leads up the hill to the Gibralfaro castle (a Parador), offering extensive views over the city. 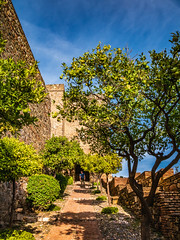 The castle is next to the Alcazaba, which in turn is next to the inner city of MÃ¡laga. 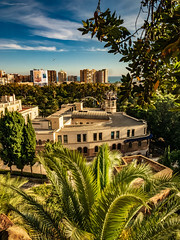 By taking the Paseo del Parque, a promenade that runs alongside a park with many palm trees and statues, one can walk from the Alcazaba to the harbour. Harbour, one of the most important in Spain. Cathedral of the Encarnation (neoclasical). The city is served by Malaga Airport. The main rail station is MÃ¡laga-Renfe which is connected with Madrid Atocha by Talgo 200. The city has two CercanÃ­as (commuter train) lines and a metro system is under construction.Buses are the main form of transport around the city. Malaga's bus station is connected with the city by the bus line number 4, although it is only 10 minutes walk to the Alameda from there. Guia Viva, Andalucia, Anaya Touring Club, April 2000.